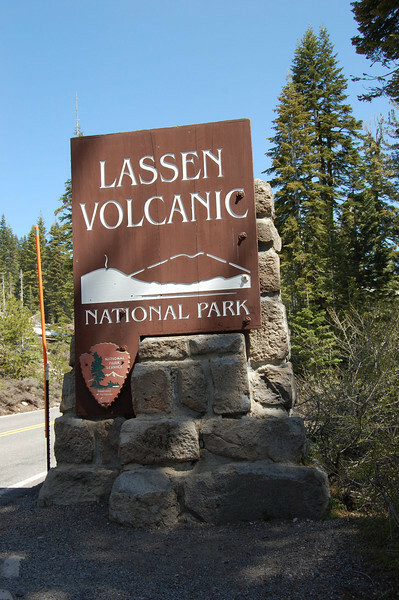 We were only 30 miles away, so we decided to check out Lassen Volcanic National Park today. Actually, there are multiple entrances to the park. 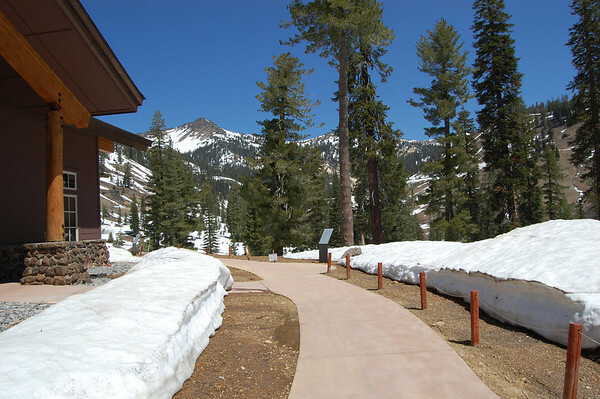 But the main park road is CA Hwy 89 which winds through the park for about 25 miles. 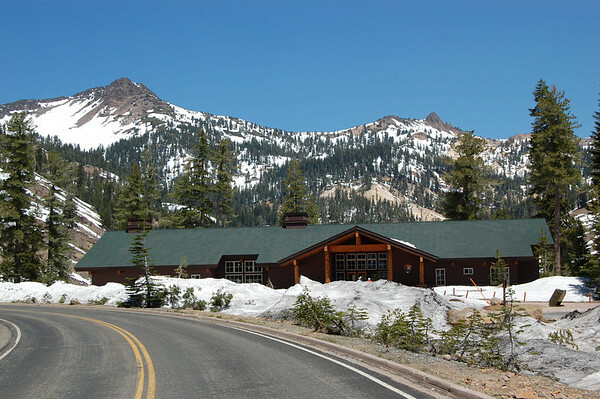 There are visitor centers at both the north and south entrances on Hwy 89. 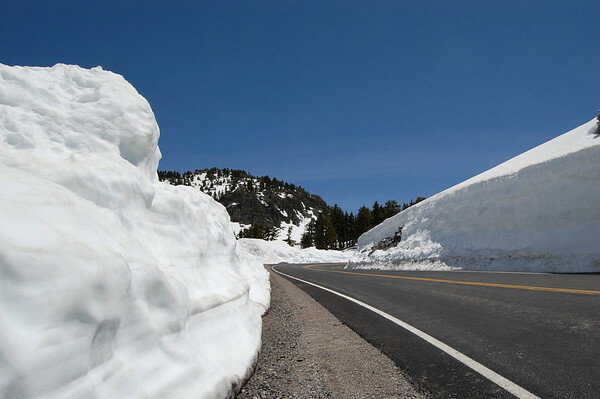 However, the road does not open completely until the heavy snow in the middle of the park can be removed. 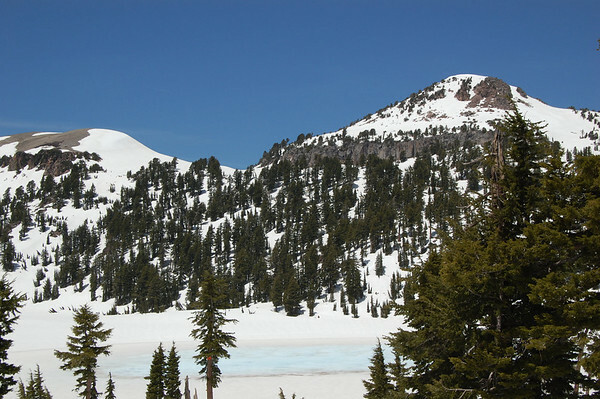 The park gets an average of 42 feet of snow each winter. Sometimes the road opens in May and sometimes it doesn't open until July. It's supposed to open sometime early next month. 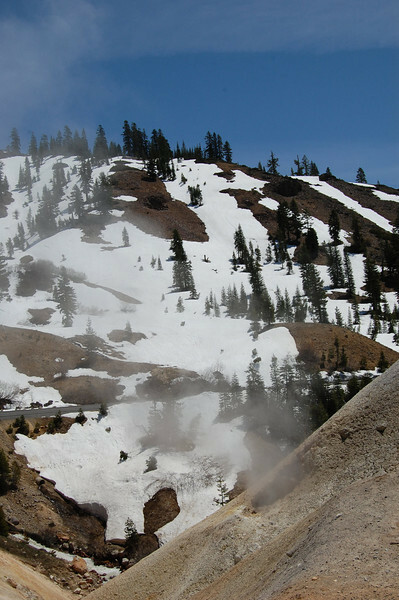 We knew that the main road wasn't fully open yet for this summer, but we figured we wouldn't be able to see the whole park in one day anyway. We arrived at the south entrance around 11:00 a.m.
the snow was quite evident. There was still two or three feet of snow around the parking lot and sidewalks and on the roof of the backside of the building. This new visitors center is wonderful with great displays, a bookstore, a gift shop, and a large cafe. As we always do, we watched the movie about the park. It was recently finished and was definitely worth seeing. 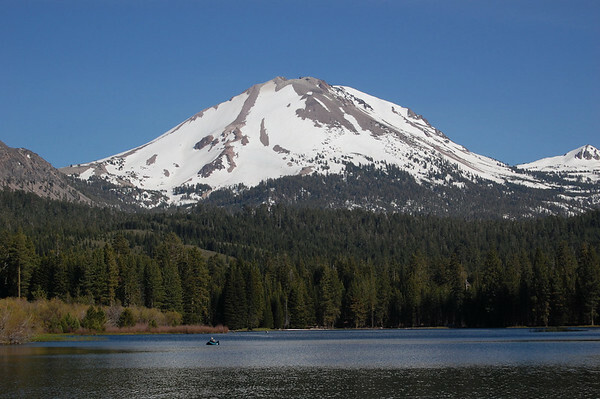 We learned about the four types of volcanoes - Lava or Plug Domes, Cinder Cones, Shield Volcanoes, and Composite Volcanoes. All four types are present in this park. 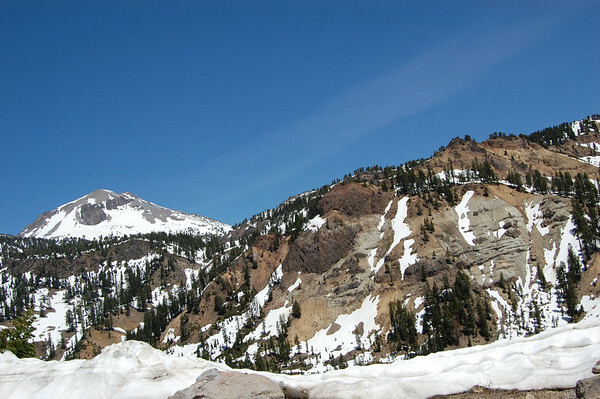 Now, though I knew the road was closed a few miles into the park, what I didn't realize was how much snow there actually was and that all the trails on the southern end of the park would be closed or have snow too deep to trek. 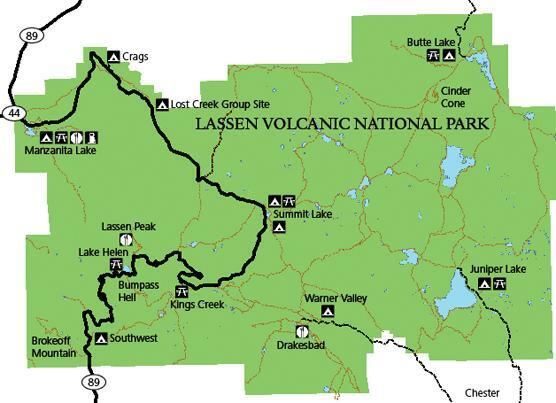 So, although there are 150 miles of trails in the park, none were really accessible on the southern end. We could see steam coming from other areas, but only those two features were accessible. It's just unsafe for visitors to get near the other areas. Interesting, but not really much to see. We got back in the Jeep and drove on. 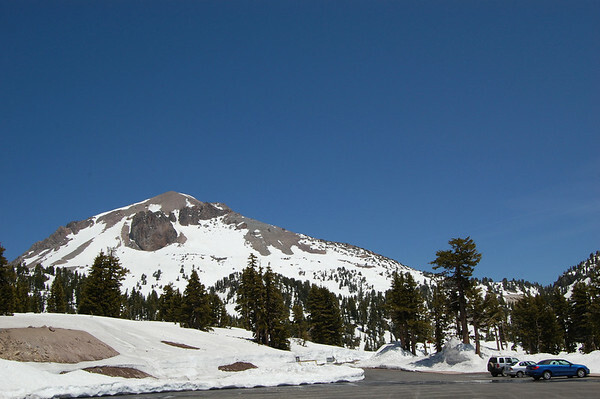 I stopped and got a couple photos of Lassen Peak as we climbed the windy road. I figured we could walk to it. Wrong. Again, the snow was just too deep and the trail was closed. The only hiking we could do on this end of the park was along the road from the closure point to where they were still removing snow. 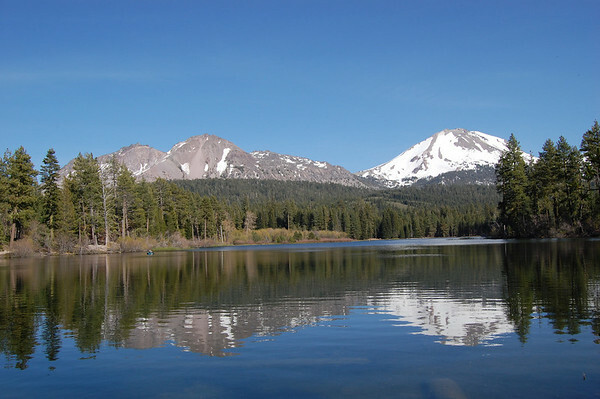 I knew there were a couple of beautiful lakes in the area along the road, but, silly me, it never occurred to me that they would still be frozen. Linda & I walked past the "road closed" signs admiring the views and the quiet. 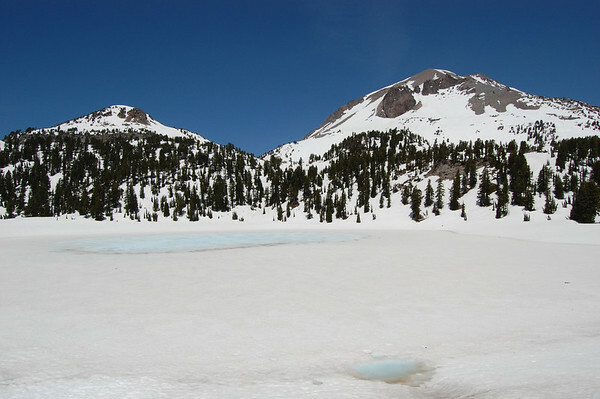 We climbed up on some of the packed snow for a look at the frozen Lake Helen below Lassen Peak. There was just a little turquoise where the ice was thinning. 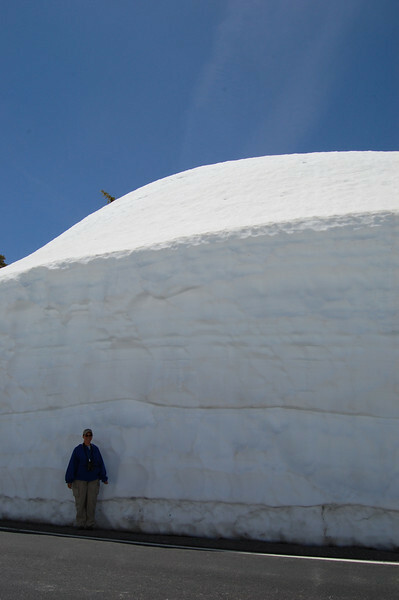 We also got some photos of the depth of snow along the road. We walked in a mile or so. Linda wanted to walk to where the snow plows were still clearing the road, but we had no idea how far that would be and we hadn't brought our water when we left the Jeep. We decided it wouldn't be a good idea to walk very far without water at the 8,000 foot elevation. 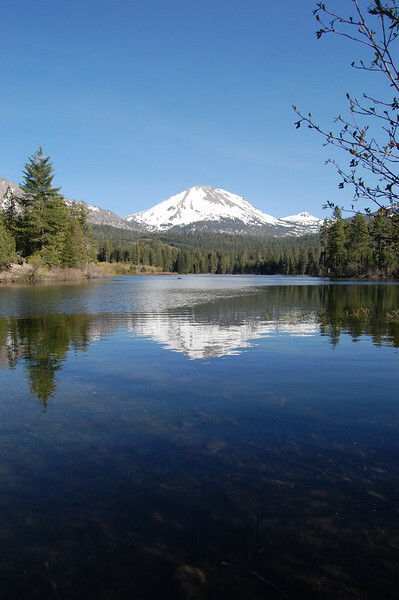 Another shot of Lake Helen as we started back. So, we just returned to the Jeep and drove back out of the park. I stopped for one more shot of a lava rock cliff face with its colorful variety. Since we hadn't spent much time, we decided to drive around to the north entrance of the park. A ranger in the visitors center had given us a map of a "shortcut". The shortcut would still take us an hour and a half to get there. Some shortcut. Along the way, we saw some pretty creeks and wildflowers. We also saw a wild turkey with a single chick cross the road in front of us. We'd seen plenty of turkey chicks, but never a wild one. We finally arrived at the north entrance. We drove the ten miles that we could access from the north side. That drive was quite different with no snow along the road at all. However, there again wasn't much in the way of features along the way, either. We stopped at the end at the "Devastated Area" parking lot and took the little half-mile self-guided interpretive trail. 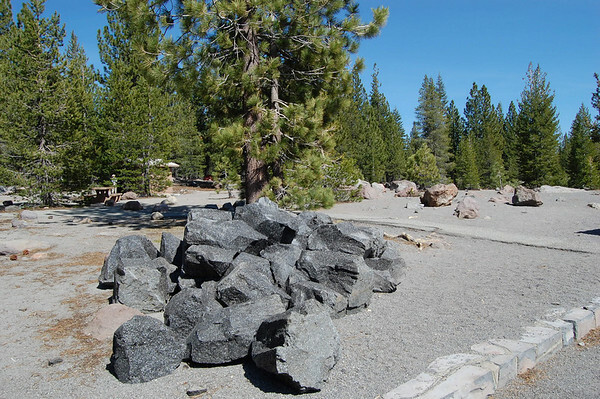 It was interesting to see the different volcanic rock that had been spewed or carried down three miles from Lassen Peak during the 1915 eruption. 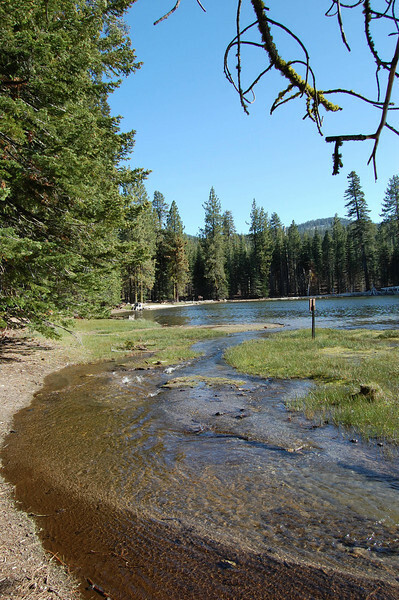 After that, we returned to the north entrance and walked the trail around Manzanita Lake. That was certainly the highlight of our trip to the north entrance. It's a beautiful lake and the birding was good. 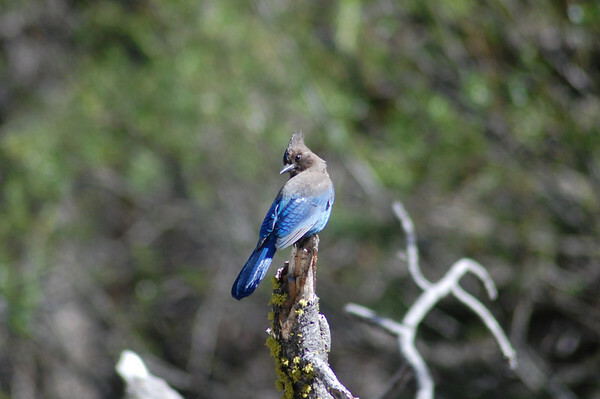 I got a rare opportunity to photograph a Stellar Jay. They are all over this area, but they rarely sit still enough for a picture. 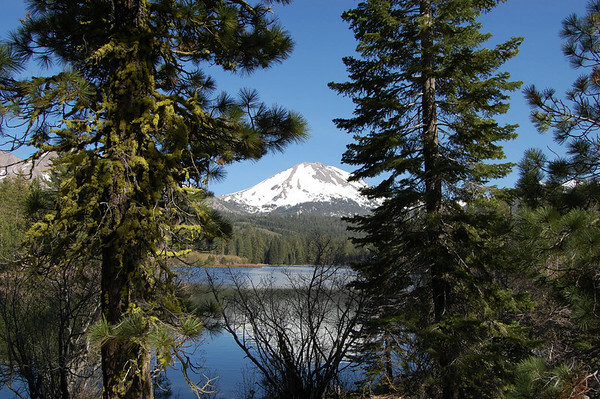 Walking around the north end of the lake gave us many photo ops of Lassen Peak from a different perspective. 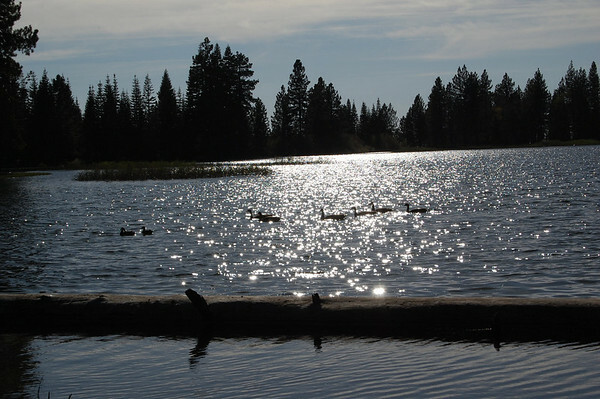 Non-motorized boats, canoes, kayaks, and float tubes are allowed on the lake. We also saw a few muskrats swimming with mouthfuls of grass we assume they were using for nest building in the banks. Couldn't ever quite get a picture though. The main quest for me was the classic reflection of Mt. 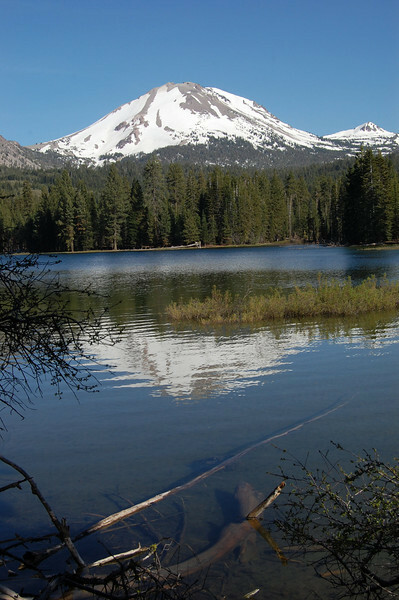 Lassen (or Lassen Peak) in the lake. It was a little breezy and the water had ripples, so I never could get that perfect reflection shot. But what we got wasn't bad. as we walked counter-clockwise around the lake. 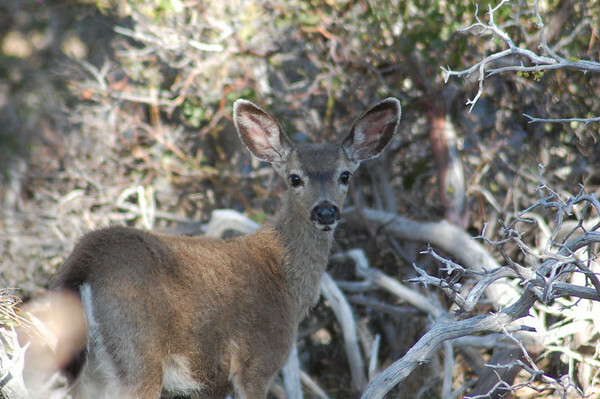 On around the lake, as we watched the geese and ducks and other birds, we came across a doe and her fawn. The fawn was quite curious as I took a few shots. We finished our tour of the lake and I took a couple more shots of the sun glimmering above the lake as a line of geese swam through the reflection. 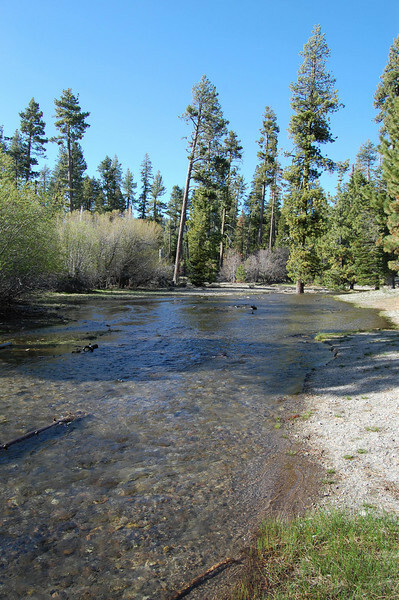 Eventually we got to the point where Manzanita Creek flows into the lake. 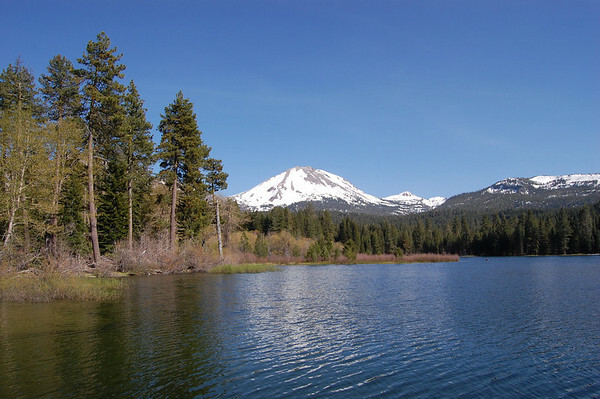 They stock the lake with trout and they have catch and release fishing. But the creek is where all the trout seemed to be hanging out. There were bunches of them, big ones. Of course, there was a sign that said "Manzanita Creek Is Closed To Fishing All Year". We finished up our lovely walk and decided to head home. 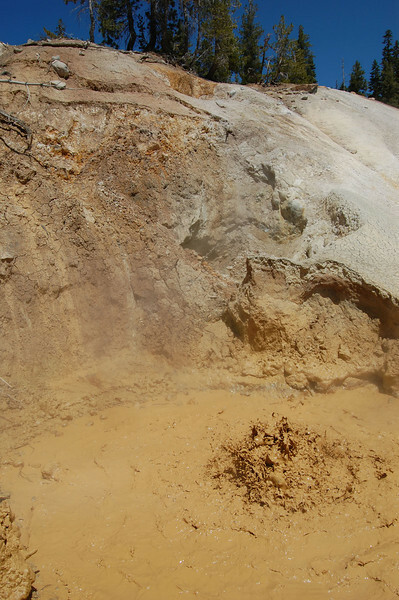 Rather than take the "shortcut" back the way we came, we figured it would be closer to go back a different way. It turned out we were right as we cut off a good half hour or forty-five minutes from our drive. We finally got home around 7:30. It had been a long day of driving. California is a big state, and what looks like a short distance on a map seems to be a lot farther once you are on the road. 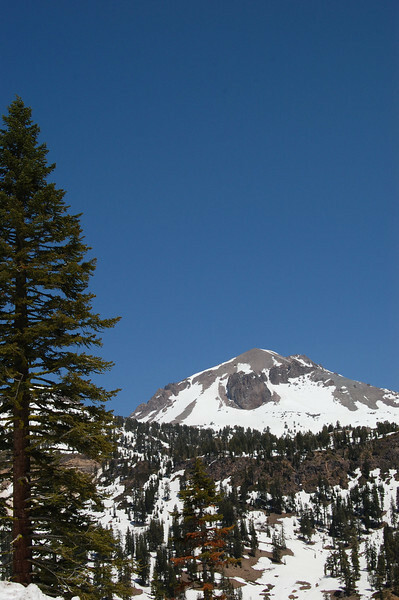 But we had a good day and we can't wait to go back and visit other areas of Lassen Volcanic Park as it becomes fully open. Some of the best parts don't actually open until July, so there'll be no rush.